Finding ice in the base of a freezer is a common fault. 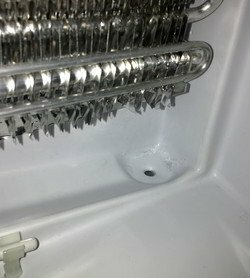 I’ve recently had to repair my own freezer with this problem and this article documents what I did to fix the fault. This issue can affect stand alone freezers, or the freezer section of a fridge-freezer. Sometimes a build up of ice may also (or exclusively) be hidden behind the back wall of the freezer. 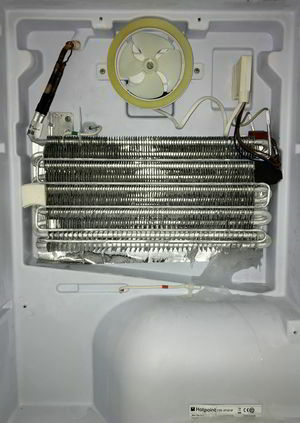 This can cause the freezer to not cool down to the correct temperature due to restricted airflow, and/or cause a high pitched searing noise if the circulating fan catches on the encroaching ice. Eventually the ice can jam the fan completely causing a major loss of cooling. A build up of ice in the base can be caused by a blockage in a channel designed to direct water into an evaporation tray. This causes water to spill over the channel and into the base of the freezer where it of course freezes. The fact that this water freezes tends to indicate that the freezer is otherwise functioning OK. 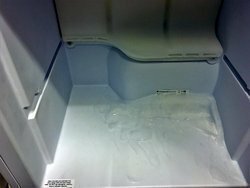 The build up of ice can prevent the bottom drawer from opening properly causing it to get broken when frustratingly rammed shut or forced open. Defrosting the freezer is the easiest way to deal with this. However, this often only proves to be a temporary fix because most people don’t defrost it thoroughly enough. Defrosting until all the visible ice in the base has gone isn’t enough. The blockage is usually caused by solid ice in the drain hole behind the back wall, or there is ice packed behind the back wall. Because this wall is insulated a normal defrost will usually leave ice still in place. New water will continue to run into the base and freeze up again. 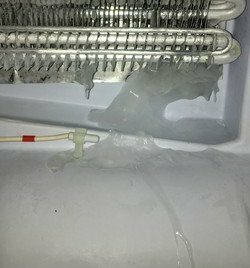 To properly defrost a freezer with this suspected fault you need to unplug it and leave the door open for 24 hours, or remove the back wall and let it defrost (optionally carefully assisting with a hair dryer). To make sure the ice was completely gone and the hole in the drain channel was clear I unplugged the freezer and then took off the plastic cover at the back of the freezer inside. In my case there were only 4 screws to remove. The cover came off easily revealing the fan and channel with all the excess ice (see pic). If the plastic wall is frozen up and won’t come cleanly off after the screws are removed – don’t force and break it. Allow it to defrost a while, or use a hair dryer to gently warm it up around the edges. The photo at the top of this page shows the ice in the base of our freezer. The photo to the left shows the ice that was behind the back cover. It’s in the bottom right corner under the metal section. You can also see the sloping channel where defrosted water should run down to the right and out through the drain hole in the corner. The hole was blocked solid with ice. You can even see the trickle line where water has run from the channel into the base. Taking care not to get too close to any plastic or sensors I assisted the defrosting by carefully blowing warm air with a hair dryer. I also used a little warm water which I carefully poured into the hole to melt through the ice that was blocking it up. I then pushed a small bit of plastic through the hole to make sure it was clear. It was then just a matter of re-fitting the plastic back wall and plugging the freezer back in. I put it on the fast freeze option to assist getting it back down to temperature as quickly as possible. The photos below show the ice blockage before and then the clear drain channel and hole after proper defrosting. Clearly ice should not build up at the back and block the drain hole. There could be a fault in the PCB or a sensor causing it to over-freeze. Or even (if fitted) a failure in the auto defrosting system. Excessive frosting which looks more like hard snow than clear ice can be caused by moist warm air getting drawn into the appliance as described in this article Icing up in fridge or freezer. If the fault quickly re-occurs you need to call an engineer. Book appliance repair – Please consider using one of my advertisers for your appliance repairs. This photo show the main compressor at the back of the freezer. Above it is a black plastic tray. This is where water from the channel inside runs. 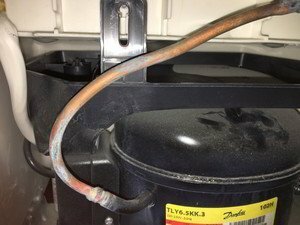 The heat generated from the compressor slowly evaporates the water. If the channel inside the appliance is blocked as described in this article water will instead run into the base of the appliance. Affected by temperature of room? How are fridges and freezers affected by room temperature? | Can you run a fridge or freezer in a garage? Many thanks for the articles on the icing up of fridge freezers. I searched high and low for a solution to why my 5 year Neff integrated fridge freezer had stopped working and your common sense explanations and pictures saved me £1000 for a new one. Brilliant. 24 hour defrost and fully functional once more.